Today would have been James Stinson's 49th birthday. 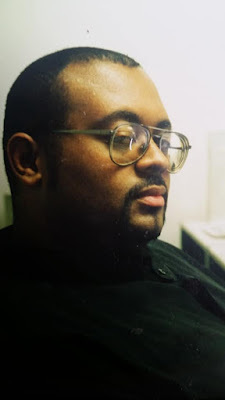 To mark this day his friend, the graphic artist Abdul Haqq, posted this never before seen image of James on his Facebook page, The Drexciyan Empire. This is only the third image we have seen of him. This is certainly a very Drexciyan story. If you are curious what could happen slaves of the 1700s you will find this podcast very interesting. This is a Gerald Donald special mix from IDA Raadio last month. They are based in Tallinn, Estonia. Analogue Interface, an Australian based radio show, had a Drexciya Day show and have an excellent and extensive piece about their influence on a number of producers they interviewed, including Go Nuclear, Detroit's Filthiest, DVS NME, Fleck Esc, Rings Around Saturn, 96 Back, Cygnus, Defekt, Jensen Interceptor, Adapta, Datawave, Blixaboy, Reedale Rise, Assembler Code and Daze. UK producer and DJ, Captain Johnson, has created a new EP dedicated to James Stinson. All the tracks were recorded live with an Electribe 2, Tr-09, JX-03 and Volca FM.You can hear all the tracks in full at this link. This is a really great mix of Heinrich Mueller remixes by morri to whet your appetite for the new compilation, False Vacuum, on WeMe Records. Here is yet another new Stinson/Mueller mix for you to explore and others here and here.